FCCB #271 - St. Patrick's Day! Make a project with a St. Patricks Day theme. For my project I've chosen to use the adorable clover treat box by Dreaming Tree, our sponsor, as well as Cricut cuts from the Simply Charmed (lucky & leprechaun cuts) and St. Patrick's Day (rainbow) Cartridges. A bit of Distress Inking gives shading to the edges of my cuts, and then I filled my treat box with Easter grass and used popsicle sticks to create stands for my Cricut cuts so they can pop out of the basket. I like to avoid cutting multiple colours of cuts that are tiny, so often I will sync all the small cuts in Cricut Design Space to cut on white cardstock and then colour them myself after. I used alcohol markers to colour in the cheeks, hat buckle and button and sponged on Distress Ink to colour the leprechaun face. I also cut the middle strip of the rainbow white and then sprayed with a gold mist for shimmer. I used an older CTMH stamp for the St. Patrick's Day sentiment. I was able to bend the stamp to fit the rainbow since it is a clear stamp. I stamped a script stamp with Versamark Ink and used Perfect Pearls to add a shimmery gold script on the treat box clovers. You can find the YouTube tutorial on how to assemble this cute box here. Thanks so much for joining me today! 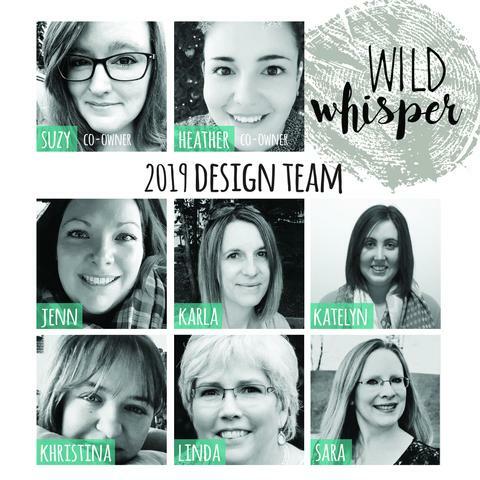 Don't forget to visit our sponsor, Dreaming Tree, as well as stop by the Fantabulous Cricut Challenge blog to see all the other awesome projects the design team has come up with! 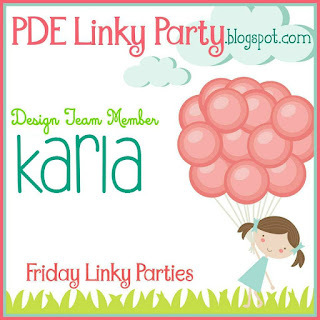 PDE Friday Linky Party - Vegan Banana Bread! Hi there! It's almost the end of the week.... Hope you had a lovely one! I'm sharing a project for this week's PDE Linky Party - the theme, as always, is Anything Goes, and we'd love to see what you've been working on! I wanted to share this Vegan Banana Bread I recently made for my oldest daughter who is vegan. I have had good and not so good experiences with different vegan recipes. When you bake without eggs it changes your end result somewhat, but I seriously could not tell the difference when I ate some of this bread. And, my daughter loved it! I used some scrapbook paper to package it up over the plastic wrap to keep it fresh. Then, I added a doily and a couple circle diecuts, and I stamped a couple of hearts around my hand written tag. I'm a firm believer that adding a few extra touches to the packaging adds so much to the gift! Thanks so much for joining me today! I hope you have a wonderful weekend, and if you love baking you can give this Vegan Banana Bread a try a let me know what you think! Don't forget to check out the fun projects the other PDE Linky Party Design Team members have come up with for you this week, and enter your own so we can see what you've been working on! 28 Lilac Lane Collection by May Flaum! I'm posting over at the Scrapendipity Way Of Life blog today, and since I picked up the Most Awesome Distress Crayons from Selena's truck last week I just had to share how I made this card with them! 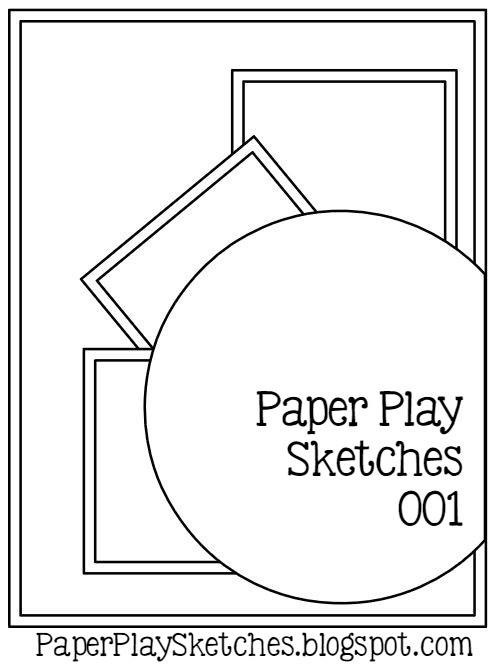 I started off by taking a piece of Specialty Stamping paper, which is a little glossy and helped me move the crayons around a bit, but you could use a piece of white cardstock as well. I found some Heidi Swapp stencils and for the polka dots and hexagons I rubbed the crayon directly through the stencil. I rubbed a bit of the other crayons on the white areas and smudged it with my finger. Then, I took a baby wipe and wiped through the stencils to create a negative effect. I used one of the crayons to edge around the piece of cardstock and then gently smudged it with my finger to blend it around the edge. I used my new Hero Arts Neon Ombre ink pad to stamp on these Tim Holtz butterflies and then shook on some clear Crystal embossing powder, which has a bit of shimmer in it. Another Tim Holtz sentiment stamp added detail to the front of the my piece, stamped in grey Archival Ink. Here's a close up of the finished piece. I added a bit of Pink Distress Marker inside the butterflies and a couple pink flowers at the bottom. I used the Distress Crayons to add colour to my seam binding ribbon, which Selena can get in by the roll! This is really my favourite ribbon. After rubbing it on I sprayed it with water and then rubbed it with my finger to blend it. The crayons don't automatically blend with water like the inks, but do blend when you manipulate them. Thank you so much for joining me today! Have a fun and crafty week! February Calendar With Pretty Cute Stamps! Hi friends! I hope everyone enjoyed a wonderful weekend! The sun has been out, the snow is melting, and even though it's still a little chilly, it does feel like spring is coming soon! Today, I wanted to share our family's monthly calendar with you and the way I use the awesome stamps from Pretty Cute Stamps to plan the month. I picked this planner up at Costco in the fall and really love the large spaces it has for keeping track of our family activities. At the beginning of each month I sit down and fill out everything I know that is scheduled, and then as things pop up I put them on throughout the month. 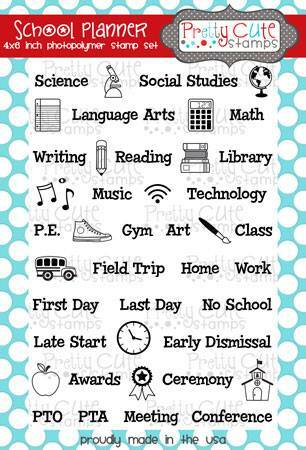 My go to stamps each month are the School Planner and Everyday Planner stamp sets. Then I choose from the other sets I have depending on what is going on. You can see some stamps from the Happy Crafting set on the 3rd and 12th, and stamps from the Be Mine set on the 13th and 14th. This month I've added a Happy Birthday for my hubby's birthday from the Little Llama set on the 24th. The coffee cup on the 23rd is from the Coffee Faces set (with a heart from Little Llama). On the 8th and 24th I used stamps from the Great Chemistry set as well. I like to decorate the top of the calendar, and this month I used the Eskimo Kisses set. Love this cute girl and igloo! After stamping I coloured in the girl with coloured pencils, and I stamped the igloo with a Kaleidoscope ink pad, adding shading with my pencils. I love using these variegated ink pads for my planner and calendar stamping - I can choose a particular colour within a pad or stamp the colours together to get a different look. 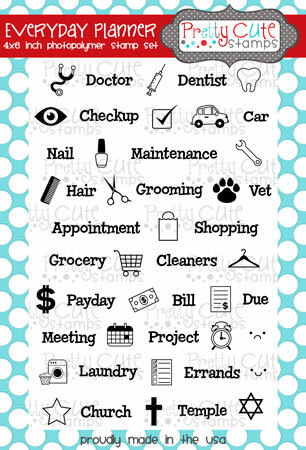 Here's a look at the cute planner stamps I've used, and you can have a look at all the fun PCS planner stamps here. Thanks so much for joining me today! Hope you have a fun and crafty week! 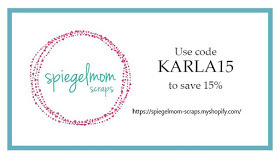 It's been a busy week here with all the fun sneak peeks and the New Release Blog Hop from Pretty Cute Stamps, and now I get to share my card with you for our monthly challenge! For my card I paired the two awesome sets Donut Worry, Be Happy with Coffee Faces! Because everyone knows coffee and donuts go perfectly together! I used a background of patterned paper from Fancy Pants Design and used Distress Markers to watercolour my images. My pretty bright reddish orange ribbon is a prize I won from Karen at Little Scrap Pieces! Love this crinkly ribbon! I love the font on this What's Brewing sentiment! 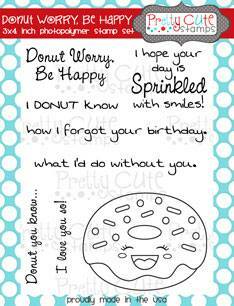 Inside, I stamped a cute sentiment from the Donut Worry set and added a coffee cup with a cute face! A few more scattered sequins finishes it off. Thanks so much for joining me for coffee and donuts today! 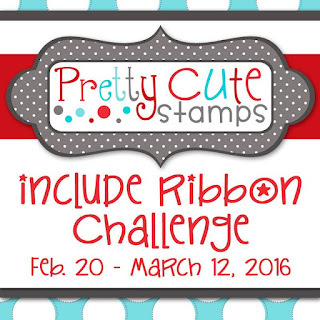 Don't forget to stop by the Pretty Cute Stamps blog to see what all the other Design Team members came up with for this ribbon challenge, as well as entering your own project. 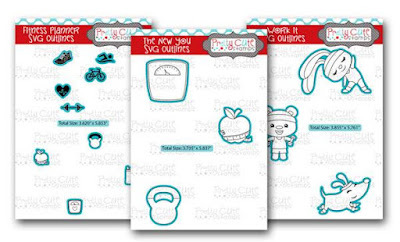 You can also see the awesome inspiration that we've come up with using the cute new Fitness Stamps released this month! 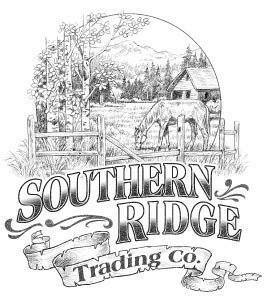 They are on sale right now until February 23, 2016! Pretty Cute Stamps February 2016 New Release Blog Hop! Thanks so much for joining us for the February 2016 New Release Blog Hop, where we are all sharing projects featuring the new stamps this month that are now available in the Pretty Cute Stamps Store. If you came from Joann's blog - JLopez Designs, you are in the right place. If you just stumbled across this post and would like to start from the beginning, please visit the Pretty Cute Stamps Blog. 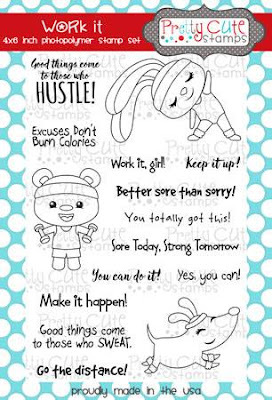 For my project for the hop, I've used the Work It stamp set to create this cute motivational card! I just love all the sentiments in the card. 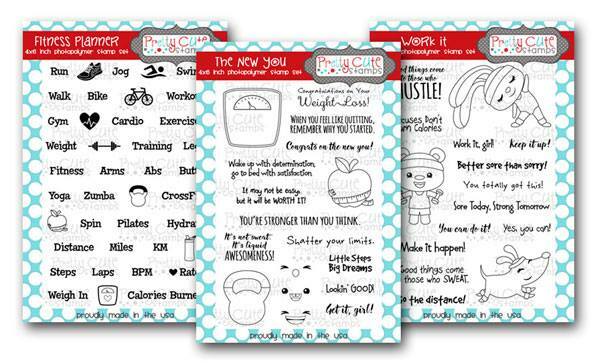 They are perfect for inspiring someone or using them for fitness! I stamped my images on watercolour paper and then used Distress and Tombow Markers to watercolour them in. I really like scribbling my markers on acrylic blocks and then picking them up with a wet paintbrush. I'm finding it easier to apply and layer colour that way rather then colouring directly onto my paper. I used a speech bubble from the Let's Talk stamp set and added one of the sentiments from the Work It set inside, and I added a bit of Stickles and some sequins to add some sparkle! One more motivational sentiment inside! There are so many different occasions this would be perfect for! Here's a look at this adorable stamp set! A random winner will be chosen on February 22, 2016. Be sure to check the Pretty Cute Stamps Store to pick up your favorite sets - the New Releases will be on sale through February 23, 2016, and you can save even more by purchasing the February 2016 Stamp Bundle! You can also pick up the SVG outlines for each of these stamps at the store!! There is also a FREEBIE cut file available for today only at the Pretty Cute Stamps blog! How cute would she be paired with the Work It sentiments?!! 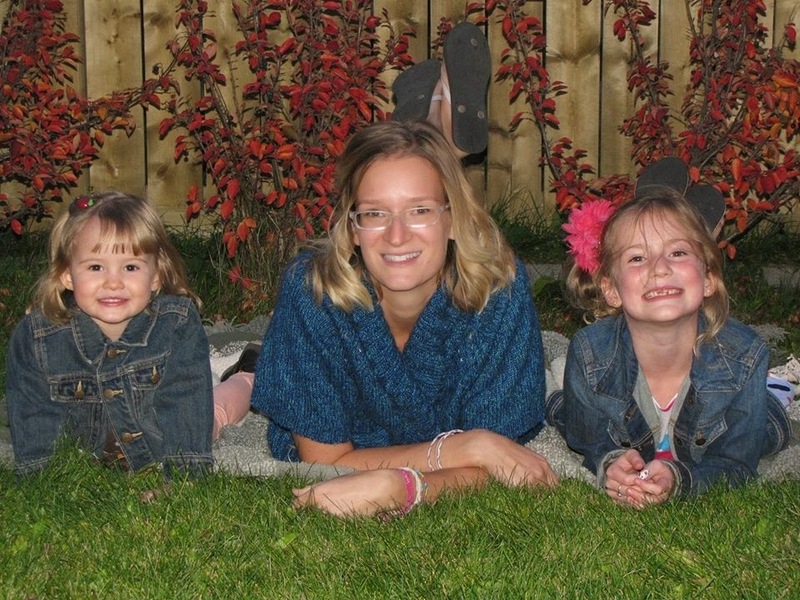 Now, you can head over to the next stop on the hop- Jen Davis' blog! 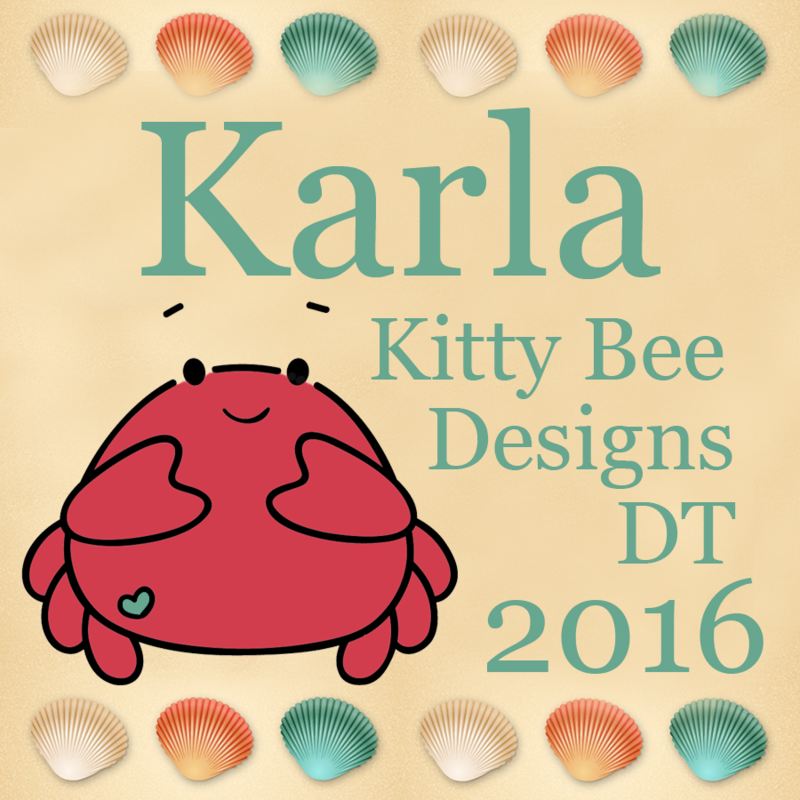 Pretty Cute Stamps February 2016 Sneak Peek! 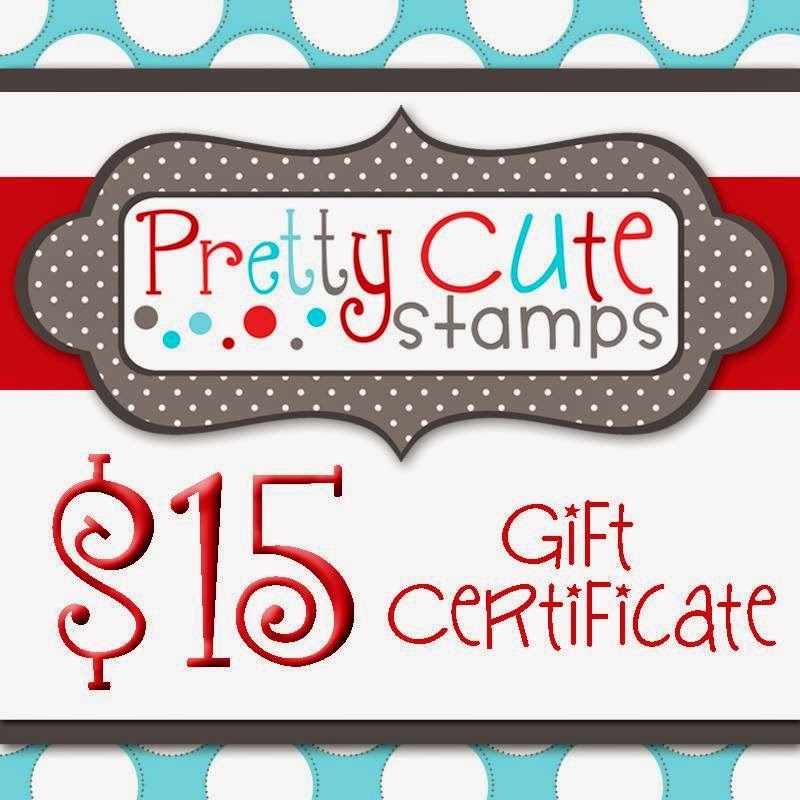 I can't wait for you to see the new stamp release from Pretty Cute Stamps this month!! However, you will just have to make due with some sneak peeks till Friday! Today I'm showing you a card made with the super awesome Fitness Planner stamp set! 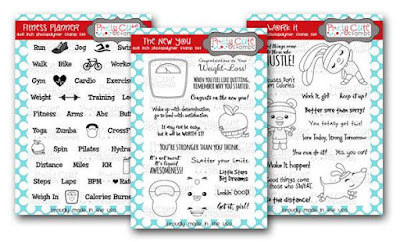 This set is so perfect, of course, if you have a planner, but also has so many awesome fitness words, and cute images, that are perfect to add to a card, scrapbook page, pocket page, etc! For my personal planner I use the MAMBI planner. I use it for things I need to keep track of on my blog as well as any 'me time' activities. 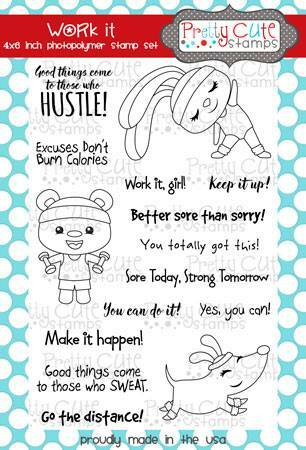 I added these super cute fitness stamps in my planner to remind me to get active each day! I love the little water bottle image, and I simply put a mark beside it each time I drank a glass of water. 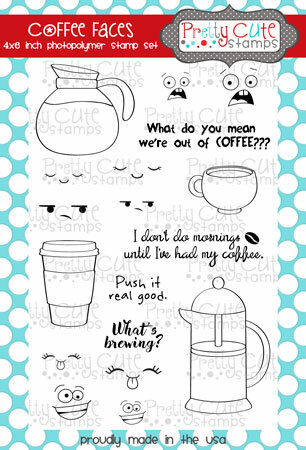 As well as the Fitness Planner set, I used lots of fun Pretty Cute Stamps in my planner, including the School Planner and Everyday Planner, along with Coffee Faces, Be Mine, Awesome Arrows and Let's Talk. 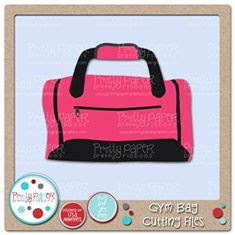 Be sure to stop over at the Pretty Cute Stamps blog to check out all the awesome sneak peeks for you from yesterday and today, as well as today's super cute FREEBIE Gym Bag cut file! Thanks so much for stopping by! Be sure to come back tomorrow for the New Release Blog Hop where you get to see all the stamp sets, another FREEBIE and lots more inspiration! I have two more layouts to share with you today for the 27 Day Challenge for February that Mercy Tiara is hosting. You can find out about all the details on this blog post and see the homemade kit I made to use in this challenge. 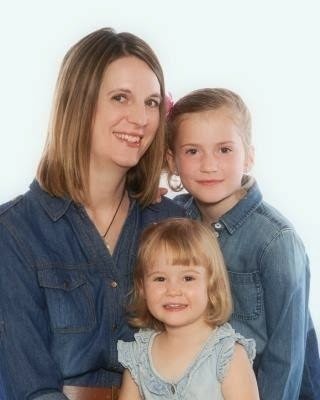 I wanted to continue on with the baby album I'm working on for my youngest, Erica. For the first page today I used a diecut background Pink Paislee paper layered over a piece of pink cardstock. I cut my photo into a circle, matting it with two more papers and inking the edges. I cut the 'Baby' title with my Cricut and layered it along with papers and chipboard stickers. I used a bit of red Distress ink on a Heidi Swapp heart stencil in the corners. I used a black pen to trace my diecut word to make it stand out a little more. Love these little October Afternoon papers! And the No. 3 sticker worked perfectly for this 3rd sweet baby! For the second page I used a full sheet of the Pink Paislee paper for the background and journaled right on it. I again used my Cricut to cut the title and layered my photos over some border papers and a strip cut from some of the lacy coordinating paper. I added a bit of Distress Ink lightly around the edge of my title cut. The Maggie Holmes diecut ephemera have really been some of my favourite things to use! I'm really liking these flair badges! The E for Erica was perfect! Thanks so much for joining me today! Don't forget to check back tomorrow for the fun sneak peek coming your way using the February New Release stamps from Pretty Cute Stamps! Paper Pieced Tea Cup Girl! Drink Me, Tea Cup Card! FCCB #269 - Valentines Day!